You might know Jonathan Wilson as a football journalist (Guardian, World Soccer magazine, Sports Illustrated etcetera) and author of four books (including Behind the Curtain: Football in Eastern Europe, Inverting the Pyramid), a tactics genius and historian, an expert on Slavic and Eastern European football, a Guardian Football Weekly regular, and a giant brain sitting in a tub of nutrient solution hooked up to a talking computer wheeled around by some lackey in a janitor suit, writes Richard Whittall. Well, he's certainly most of those things, but now he's also the editor of a massive (184 pages!) new football quarterly called The Blizzard. In the first few days since its launch, the publication has lived up to the name, spawning interest across the football blogosphere and beyond interested in the impressive roster of writers (Kuper, Marcotti, Cox, Smyth, Auclair, good lord I'm frightened) and subjects well-outside the whitelines of mainstream media. I've downloaded my PDF of Ish Zero and it's a cracker, with everything from Dutch political conservatism and its affect on Dutch football to Ule Hoeness' taste for sausages. You should go do the same (it's pay what you like, cheapskates). Anyway, Mr. Last was kind of enough to ask me to ask Mr. Wilson's electronic voice generator gadget a few questions on The Blizzard's launch and some of the back story of how the magazine came to be (Danny had a few Q's of his own: try and guess which are his!). Hope you enjoy my chat with Jonathan Wilson, Editor of The Blizzard. Hi Jonathan, thanks for talking to EFW, and congrats on the launch of The Blizzard! First, tell us about the name of the new football quarterly, which comes from a Sunderland fanzine published by a Sidney Duncan in 1893. How did you first become aware of the original Blizzard? This isn’t as interesting a story as it might be. I’d love to say that as a child I slept in a box that was lined with it or that I found a sheaf while clearing out by gran’s attic, but the truth is Peter, who runs the design and publishing side of The Blizzard, told me about it. And he found out from his mate Neil Young, who’s a film critic. And he knew about it because he’s the sort of bloke who knows that sort of thing. It’s not a fanzine, though; it was a weekly newspaper. Duncan himself, from what we can make out, was a survivor of the Victoria Hall disaster. "I’d come to realise I wasn’t the only one who felt journalism as a whole was missing something, that there should be more space for more in-depth pieces, for detailed reportage, history and analysis. Was there a way, I wondered, to accommodate articles of several thousand words? Could we do something that was neither magazine nor book, but somewhere in between?" In your opinion, has this frustration with the editorial limits of print media been simmering for a long time among full-time football journalists, or is this a more recent phenomenon? Are there any comparable precedents for a publication like The Blizzard? If not, why are we seeing it now in 2011 instead of say twenty or thirty years ago? Back in the late nineties, there was Perfect Pitch, edited by Simon Kuper and Marcela Mora y Araujo, which was similar in some ways, and ran to four issues. I wouldn’t pretend to know the ins and outs, but I’m pretty sure it took the Dutch magazine Hard Gras as its inspiration. It was excellent, but – I think – the problem it had was that it was run by a publishing house, and so there was an emphasis on the bottom line which we don’t have. Plus big companies turn more slowly and perhaps are more resistant to innovation. The advantage we have is the internet, which means we can sell through a website, cutting overheads. The rise of social networking makes it far more possible to get a buzz about these things: we’re not reliant on people wandering into a book shop or newsagents and seeing it. There is, of course, an irony in that the internet is, we’re told, what’s killing papers. Newspapers have responded to the challenge largely by cutting the length of pieces and shifting to the middle-ground, while they’ve reacted to the rise of bloggers by emphasising what they have that the gifted amateur doesn’t, which is access to players. I don’t blame them for that – they’re businesses that have to look after their financial status, and for all the flak they get, newspapers remain supremely good at uncovering stories. I certainly don’t want to suggest that The Blizzard is somehow set up in opposition to newspapers. That said, last year I picked up a newspaper sports section on a plane and the first 11 stories all followed the template “A player, who plays in a position for a club, said yesterday that...” I’m not sure who that benefits. A decade or so ago, it was possible to find more leisurely, more in-depth, more esoteric articles in sports supplements. Today, though, even magazines have cut the length of their features. Now I’m sure there are sound economic reasons for doing that, but it does seem to leave a gap. That’s what The Blizzard is trying to fill. Why are we seeing it now? Partly because that gap has opened up, partly because the internet has made it possible, and partly because the general culture of football has changed: the fanzine revolution of the eighties has spawned a great age of football literature as publishers have realised that there is a market for football books beyond the standard autobiographies (although I fear recent cuts mean that may be ending). Could you fill in some of the details of what happened in the year between your pub meeting in Sunderland and the launch of The Blizzard last week? Did you already have a clear idea of who'd you want to ask to contribute? How did you pitch the idea to your fellow writers? What were their initial thoughts on the project? I’d already spoken to quite a few writers before the meeting, not in a formal way, but in a general bitching about life way. Soon after the meeting I spoke to Marcela and Simon to find out what had happened with Perfect Pitch. Gradually I began mentioning the idea more seriously to people and pretty much everybody was enthusiastic. We had the idea of a profit share, which I thought would be controversial, but again, it seemed to excite people: the idea that the workers should enjoy the full fruits of their labours is intoxicating even if it was initially designed as a way of cutting overheads. It took some time to draw up the author protocol, which explains the profit share in detail, but once we had, writers all agreed to it immediately. That side of things has been remarkably straightforward. Then it was a case of getting pitches for pieces, commissioning and editing the submissions, while Peter sorted out the technical and design side. We had a couple of meetings in the office up in Sunderland, but it’s been possible to do most of the business by phone or email. Then on Friday we had the final read through and amendments, before at 1951 a bloke called Mike pressed a button and we were live. With Issue Zero clocking in at an impressive 187 pages and 25 articles, you certainly have honoured your claim on the website that The Blizzard features "no restrictions on length." You also write that "...within certain basic parameters, writers are encouraged to write in whatever style they see fit." What were those "certain basic parameters" exactly? Did you have to work to ensure there would be no major overlaps in story focus for example? Yes; of course you need a balance, both of style and subject matter, and there has to be a basic house-style as well. And while there are no restrictions on the length of individual pieces, issues will be 180-190 pages (75-80,000 words) long. Certain sections – Theory, Polemics, Greatest Game, Eight Bells – will be regular; the others will change. Ideally we want a mix of analysis, history, reportage, humour, opinion, interviews... so that’s my job as editor to try to achieve that. But I’m not going to be demanding a piece on Wayne Rooney, say; I may ask if anybody has any ideas about a certain theme, but I wouldn’t impose. From an outside perspective, the reaction to the launch of The Blizzard so far seems overwhelming. Have you been pleased with the response so far? 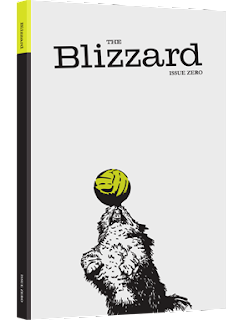 What sort of feedback have you been getting from readers on Issue Zero and the idea of a long-form football quarterly as a whole? Delighted. When we went live we really had no idea what would happen. We’d sent out a survey via Twitter a week before and that had been positive, but Friday night was amazing. I was in London, and I went out for a meal almost as soon as the site was live. There was no reception in the restaurant, so I confess I was a bit concerned because I’d been expecting at least a few emails telling me we’d had a download, but my Blackberry was silent. Then I got out onto the pavement and it went mad. It was like that scene in The Social Network where they watch the counter going up and up and up. I just wish I could have been with everybody up in Sunderland to have shared that excitement – and some celebratory booze – with them. What we have to do now is to convert downloads of Issue Zero into subscriptions and orders for Issue One, but the start has been as good as we could have hoped, and the feedback has been massively encouraging. As a soccer blogger, I find The Blizzard intriguing in light of the long-time criticism of print journalists by bloggers for not providing in-depth, long form pieces on non-headline news stories. In recent years this "gap" has led to the popularity of eclectic football sites like Run of Play and In Bed with Maradona (the latter's mission statement in particular reads very much like The Blizzard's), which, while not exactly long-form, certainly focus on areas of the game not covered in print dailies or mainstream soccer mags. Meanwhile your contributor list reads for the most part like a who's who of professional football journalism. Do you see The Blizzard in part as pro-journalists "taking back" this unexplored editorial ground from blogs? Or do you think it will compliment the growing array of well-written, non-SEO focused soccer sites written by non-professionals? I don’t think it’s a question of taking anything back – I’m not even sure the distinction between professional writer and blogger is necessarily that clear. Freelancers especially find themselves in a halfway house. When I’m commissioning, I’m certainly not going to be doing so on the basis of whether the writer is a ‘professional’ or a ‘blogger’; it’s just ‘can they write?’ and ‘is it interesting?’ I suppose The Blizzard occupies a middle ground between blogs and mainstream media, but at the same time, as a quarterly magazine, albeit one that will be available in print and digital forms, it’s not really competing with either. The Blizzard is clearly very much a labour of love. As you explain in the introduction: "The priority is the product rather than profit, so we will not go chasing readers; the aim, rather, is to remain true to our ethos and to provide an alternative to that which already exists." You've also instituted a "pay-what-you-like" policy for subscriptions. Do you think this "for love not money" approach will be enough to cover print production costs over the long-term? And have you been able to compensate the contributors for their work, and if not, is there a hope you will be able to in future based from ads and subscription revenues? I hope it’s financially viable, and the early signs are encouraging. Obviously there’s a certain threshold below which we can’t continue, but halfway through our first week, I think there are reasons to be cautiously optimistic. No contributor has been paid anything as yet – they take a share of anything that’s left once we’ve paid costs. It may be nothing, it may be quite a bit; we don’t know, but what’s been inspiring is that every writer accepted that immediately. The writers have had faith in Peter and me, and we’re now putting that faith in the public to pay responsibly. If everybody pays the minimum, we die; if we get a range of fees – and so far we have been, although it’s very early days – then we should be OK. At the moment I’d rather place that faith in our readers than set a price that some people can’t afford. As The Blizzard progresses, will you maintain it as a "friends and family" project, or do you hope to expand and accept queries and submissions from soccer writers outside of your journalistic purview? I don’t think it is a friends and family project. Yes, Peter and I have been mates 20-odd years, but the designers and writers are there because we think they’re good at what they do. Of the writers, some are friends, but seven of the contributors to Issue Zero I’d never met when I commissioned them, and three I’d met only once. I’ll commission any idea I find interesting. That said, there’ll only be about 100 articles in The Blizzard each year, so that probably means a total of around 50-60 writers. When fellow esteemed author Stuart Fuller fell asleep on the Moscow Metro he woke up to find a rather large Russian woman gyrating on his lap. Does this put your robbery in a better frame? Errrr.... I was robbed of all my money and my phone and stumbled about in a blizzard for about half an hour before a Muscovite couple put me in taxi back to my hotel. I learned a valuable lesson about my capacity for vodka and the kindness of strangers. What would you say he took from his ordeal? A bit of morbid fascination that she expected him to pay her. So would you rather be watching the Belgrade derby, the Tyne-Wear derby or Boca v River Plate? Boca v River, no question. Football in Belgrade is struggling and the derby’s nowhere near what it was – they rarely even sell out. I hate the Tyne-Wear derby because I get so nervous and because I’ve only ever been there once when Sunderland have won – and I’m thirty-bloody-four. Boca v River, though, is madly passionate: packed crowd, ticker-tape, banners, general mayhem and a real sense of mattering even if the clubs are having dreadful seasons. Do you think that today a unified Yugoslavian states team would be a world beater? In theory, yes: look at the spine of Handanovic, Vidic, Modric and Dzeko and it’s already an awesome side, but then you could say that in most decades. The 1974 World Cup team, for instance, was superb in terms of personnel, but there’s always the issue of the players getting on with each other, and history suggests that whenever a point of crisis arises, they tend to split on national lines. Which is exactly the point the Nobel prize-winner Ivo Andric makes in his novel The Bridge over the Drina. Richard Whittall writes on football from his hovel in Toronto, Canada. In addition to his A More Splendid Life site, he also writes the Canadian Soccer history blog, The Spirit of Forsyth. He is a regular contributor the Score's Footy Blog, Canadian Soccer News, and Brian Phillip's unsurpassed Run of Play. His writing has appeared in Toronto Life and the Globe and Mail, and he was a contributor for Brooks Peck's Yahoo! blog Dirty Tackle for the 2010 World Cup. He appeared once on Football Weekly as villasupportgroup. You can follow Jonathan, The Blizzard, Richard and European Football Weekends on Twitter. Like this? You might also like our James Richardson interview. I'd say Ljubljana or Sarajevo - both quite small, self-contained cities with fascinating histories, great food and booze and proud football traditions.